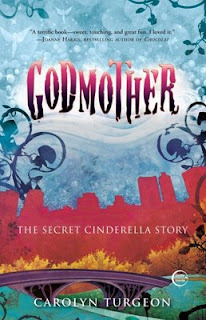 Godmother: The Secret Cinderella Story is Carolyn Turgeon's second novel. Since Godmother's release, Turgeon has published The Next Full Moon and Mermaid, the latter of which is currently in development for a movie by Sony Pictures. In present-day Manhattan, an old woman with beautiful white hair named Lil divides her time between working in an independent book shop and her lonely apartment. Her friends are few and far between, mainly because Lil has an important secret she can never share with anyone. Lil is actually Cinderella's notorious fairy godmother, but was banished to our real world forever for appearing to Cinderella's prince as a human and making him fall in love with her. As punishment, Lil must spend years in our world without her one true love, while also maintaining large fairy wings she keeps hidden and bound to her back each and every day. When Veronica, a beautiful and free-spirited young hairdresser steps into the book shop, Lil is reminded instantly of her beloved fairy sister, Maybeth, who remains behind in the fairy world. Lil then makes it her personal mission to help Veronica find her one true love in hopes that if she succeeds, she will be redeemed and allowed back into the fairy kingdom - and also reunited with Maybeth. Clever, magical, and entrancing, Godmother is a unique, though macabre spin on the traditional story of Cinderella. This novel is very intellectual, and is as much a psychological thriller than it is fantasy or literature. From the start, Godmother had me reeled in, and I found that I could hardly stop reading (and barely take a breath!) until the very last page. From the get-go, this novel will seduce you with the promise of endless possibilities and spin on this classic fairy-tale. Each and every character in Godmother is colorful and romantic, even the wistful and tragic Cinderella. Lil's transformation at the end reminds me of Natalie Portman's demise in the movie Black Swan, which I thought made this novel even more clever than I had originally thought. There's no denying that Godmother is full of surprises and utterly creative - there's absolutely NO way as a reader you'll be able to guess what happens! Turgeon's writing and story is so convincing that she (almost) had me believing that fairies were real, and that some truly do live among us with the task of finding humans our one true loves. Turgeon has talent unlike any other I've ever seen in literature, and I'm eager to read all of her other novels! Those who like dark spins on classic fairy-tales will absolutely love Godmother. I give this book the highest praise it can possibly garner, and so far, is one of the best novels I have read in the past year. Click on any of the images of Carolyn Turgeon's books below to review them in more detail on Amazon.com. What are your favorite fairy-tales, and fairy-tale adaptations? Share your comments below!